The AEM 28-20296 fits some Buick Lucerne, Cadillac DTS, Chevrolet Equinox, Chevrolet Malibu, Pontiac G6, and Pontiac Torrent models. See vehicle applications for details. 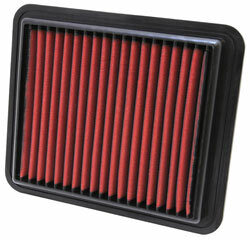 This is a very high quality air filter. In the past I had another brand, but it started to fall apart and actually caused some damage to the car. I'm very happy with AEM and will recommend them based on their quality and performance. Ordered this drop-in for my winter vehicle. Filter appears to be very well constructed. Install was rather straightforward as you might expect. My issue with AEM was with the cleaning solution I had ordered with it. The first time it had spilled in the packaging because the cap on the spray bottle was loose. One quick phone call and a few pictures later, another filter and cleaner bottle was sent to me. Unfortunately, that bottle also completely leaked out in transit as well. Called them again, another bottle was sent with specific instructions to tighten the cap. The two ladies I delt with were very friendly and sounded legitimately apologetic for the errors. I also got the impression from them that this was a common occurrence, which was a bit concerning. I had asked if they could include a simple license plate frame or something for the inconvenience, but this was refused, as they thought the extra filter was compensation enough. Being a good natured Canadian, I didn't want to argue, so I let it go. Overall, while not the most pleasant experience, the product is still pretty solid. My recommendation is if you choose to buy the cleaner spray, be sure they tighten the cap before shipping it out, or you might find a wet filter and a puddle at your door.